DALLAS -- The Dallas Stars officially welcomed former general manager and coach Bob Gainey back to the organization Wednesday. Gainey, a 1992 inductee into the Hockey Hall of Fame, will serve as a senior advisor to the hockey department. "I'm really pleased and excited to be joining, or re-joining, the Dallas Stars organization," Gainey said. "It comes at a particular good time in my career where I've had many experiences over a long period of time in pro hockey, in the NHL. I guess I'm going to be a consultant without boundaries." The 58-year-old Gainey most recently worked in the Montreal Canadiens organization, serving as general manager from 2003-10; he also was interim coach on two occasions. He had served as the Stars' coach from 1990-96 and was the club's general manager from 1992-2002. During his tenure as Dallas GM, the Stars went to the playoffs seven times, won five straight division titles, appeared in the Stanley Cup Final twice and won their franchise's only Stanley Cup in 1999. Current Stars GM Joe Nieuwendyk was a part of that team, playing for the Stars under Gainey's watch from 1995-2002 and it's clear he has great respect for him. 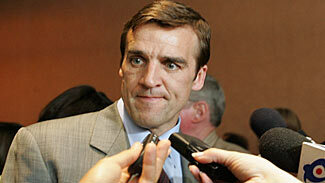 "I respect the way he is respected," Nieuwendyk said. "He's obviously a bright man and has a way about him that is a calming influence. To have the opportunity to work with Bob and to hear a voice, a calming influence, a different perspective, is going to be really good for me." Nieuwendyk said bringing Gainey back into the Dallas organization in an advisory role is something that has been in the back of the mind almost from the moment he took his current job in 2009. "I've always been interested in having people around me that have knowledge, have wisdom," he said. "It's something that's been on my mind since I took this team. I think the more people that you have in those positions, the more hockey people you have, the better it is for making decisions and just getting through the grinds of everything we go through. With Bob, there's a real familiarity there. I have history with him. We have a mutual respect for one another and we found him at a good place in his life where he was intrigued and excited about the opportunity as well." Dallas went 42-35-5 for 89 points in 2011-12, finishing fourth in the Pacific Division and missing the playoffs for a fourth straight season. It was a season that began without an owner -- Tom Gaglardi officially took ownership in November -- and it also was the club's first under coach Glen Gulutzan. Gulutzan and his staff were in attendance for Wednesday's press conference, and Gulutzan said he was looking forward to working alongside a Hall of Famer like Gainey. "Just his years of experience in all different facets of the game, it's going to be a great benefit to us," he said. "Tomorrow the coaching staff's going to have a coffee with Bob and hang out in the morning. From a coaching standpoint, especially a young coach, it's exciting to have the opportunity to pick his brain and have you help it you, so we're excited about it." Current Stars president Jim Lites also was part of the organization during Gainey's first stint with the club. So not only does he know the man well, but he also feels there isn't any reason why they can't experience similar success the second time around. "Bob Gainey's a winner," Lites said. "We want to win the Stanley Cup here. That is our goal and that's all we're thinking about 24/7. Bob Gainey's a Dallas Star and I believe that without that influence in this franchise we wouldn't have captured the Stanley Cup in '99. He was the right guy in the right place."